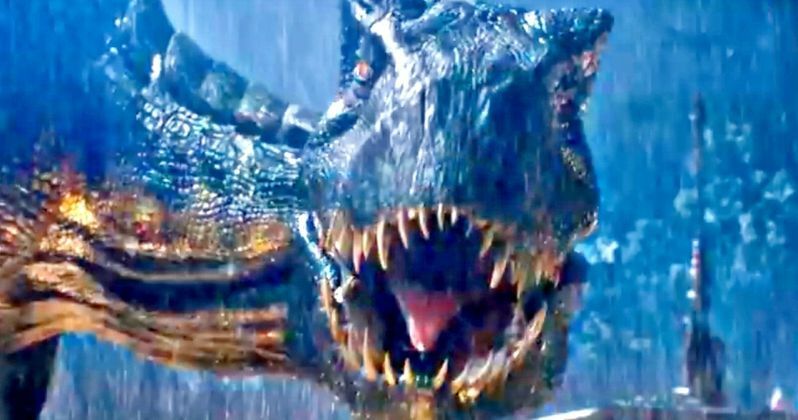 A new teaser for Jurassic World 2 has arrived online in advance of a new, full-length trailer to be released on Wednesday. Since the sequel arrives in theaters on June 22, it's highly likely that this will be the final full trailer that we get. Though, there are sure to be quite a few TV spots once the release date gets closer. For now, we have a new 30-second teaser, that packs an awful lot into a short window and really emphasizes the horror elements of Fallen Kingdom. This brief teaser opens up with the shot of Owen (Chris Pratt) in the truck with the T-rex, which doesn't go well. There are a few new shots of the hybrid Indoraptor in here as well, which looks to be formidable and terrifying. Easily the coolest shot is of the Mosasaurus from the first Jurassic World. This time, he's swimming out in the open ocean with a bunch of surfers, which is reminiscent of a shot from Blake Lively's shark flick The Shallows, only with a much bigger threat than a shark. Lastly, we get Jeff Goldblum as Ian Malcolm riffing on John Hammond's famous line, with Malcolm saying, "Welcome to Jurassic World." The big takeaway here is that clearly, dinosaurs are going to make their way to the mainland in a way that will be very threatening to human life. While we know Jurassic World: Fallen Kingdom is going to take us back to Isla Nublar, a volcanic eruption is going to force the dinosaurs off of the island. According to Colin Trevorrow, who directed the first movie and co-wrote this installment, the volcanic eruption takes place within the first hour of the movie. So that won't be the climax. It's also been promised that this movie won't just feature dinosaurs chasing people around on an island. That seems to be true, as it appears they're going to be chasing people around all over the place. J.A. Bayona (A Monster Calls) took over directing duties for this installment. It's been said that Jurassic World 2 will be darker than its predecessor and this brief teaser makes that inescapably clear. While this won't be the first time we've seen dinosaurs on the mainland, as the climax of The Lost World: Jurassic Park brought a T-rex to San Diego, this looks to be doing it on a much more grand scale. Are they going to go full-on Planet of the Apes, but with dinosaurs? Jurassic World revived the Jurassic Park franchise, which had been dormant for 14 years up to that point. The movie grossed $1.67 billion worldwide, becoming one of the highest-grossing releases ever. Universal appears confident that the sequel will do big business as well, as they've already announced Jurassic World 3 for June of 2021, with Colin Trevorrow returning to direct. While you wait for the full trailer to arrive on Wednesday, be sure to check out the new Jurassic World: Fallen Kingdom teaser, courtesy of Universal Pictures, for yourself below.